WestJet's new 787-9 Dreamliner made its official debut yesterday, when it spread its wings on its first revenue flight from YYZ to YYC. "Today's first revenue flight on the Dreamliner has been years in the making," said Arved von zur Muehlen, WestJet Chief Commercial Officer. "There are big things in store for tail 901 as it is the first 787 that will take WestJet global." The aircraft will operate on domestic flights for crew training and regulatory compliance before the first scheduled international flight between YYC and LGW on APR28. 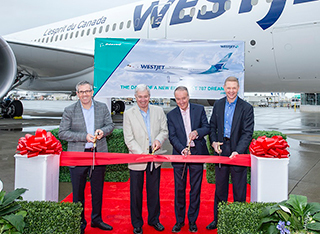 WestJet received its first of 10 Dreamliner in JAN 2019, the second on 19FEB 2019 and is set to receive the third in MAR. Hub locations and routes for the remaining seven aircraft have not yet been announced. See OJ's tour of new Dreamliner here.